Why Animals Age: They Produce Less Vitamin C. Same for humans? Due to an inherited gene mutation, humans lost their ability to internally produce vitamin C many generation ago and are totally dependent upon dietary or supplemental sources of vitamin C to avert scurvy, a state of frank vitamin C deficiency that produces symptoms of hemorrhage (eyes, skin, kidneys, etc. ), fatigue, irritability, weak bones, poor immunity, etc. On the other hand, most animals produce their own vitamin C internally, either in the liver or kidneys via an enzyme called gulonolactone oxidase that converts blood sugar to vitamin C (ascorbate). Only fruit bats, guinea pigs and primate monkeys do not synthesize vitamin C naturally and are in the same predicament as humans. In 1983 researchers in Japan reported that vitamin C levels in humans decline with advancing age apart from variations in dietary intake and that females maintain a higher level of vitamin C than males at all ages, which correlates with their generally longer lifespan over males. Vitamin C appears to raise estrogen levels which may explain its life-prolonging effects. Recently researchers in Japan measured vitamin C levels in various organs and tissues of laboratory mice as they aged. As a reminder, these animals internally produce their own vitamin C, unlike humans. So it came as a bit of a surprise to learn that in certain specific organs and tissues vitamin C levels actually rose with advancing age, increasing in the spleen, lungs, eyes and heart. Vitamin C levels rose in the liver, skin and skeletal muscles from 6 to 12 months of age and then declined from 12 to 24 months of age. (Laboratory mice live 2-3 years). Vitamin C levels remained constant in the small intestine, kidney, blood plasma and parts of the brain as these animals aged. Urinary ascorbic acid (vitamin C) levels decreased markedly until almost becoming undetectable at 24 to 30 months of age. Researchers conclude the capacity to synthesize vitamin C declines over time to become a major factor in age-related diseases in these animals. So, even among animals that naturally synthesize vitamin C, a decline in its production appears to govern the rate of aging. In 1978 researchers discovered a calcium-binding protein made in the liver called regucalcin, also known as a protein called SMP30 that regulates biological aging. It was not surprising to learn that the SMP30 protein was found within the protein sequences that make up the enzyme (gulonolactone oxidase) that facilitates that natural synthesis of vitamin C in most animals. So now biologists keenly measure SMP30 protein in animals determine factors involved in longevity. Mice synthesize their own vitamin C internally (wild type mice). SMP30 protein has been measured and found to be abundant during youth and adulthood but decreases during aging (senescence). The progressive decline in SMP30 with advancing age is associated with loss of cellular functions in the liver. The lack of vitamin C in SMP30 deficient mice accelerates aging and shortens lifespan. Researchers in Japan have noted that mice bred so the SMP30 protein is deficient have a shorter life span and have a greater tendency to develop a fatty liver condition. 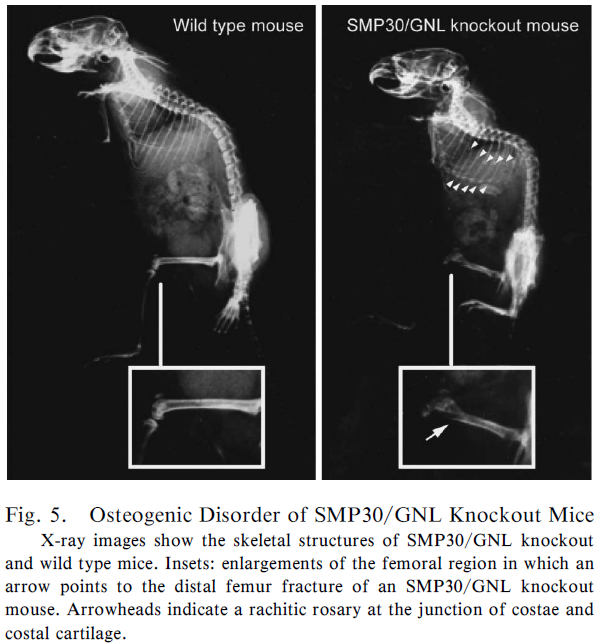 SMP30 knockout mice fed a vitamin C-deficient diet do not thrive, display symptoms of scurvy such as bone fracture, and die 135 days after beginning such a diet. The vitamin C in their livers and kidneys is less than 1.6% of normal mice. It has also been demonstrated that SMP30 knockout mice develop clearly visible deposits of cellular debris (lipofuscin) in their tissues. Lipofuscin is a marker of aging. 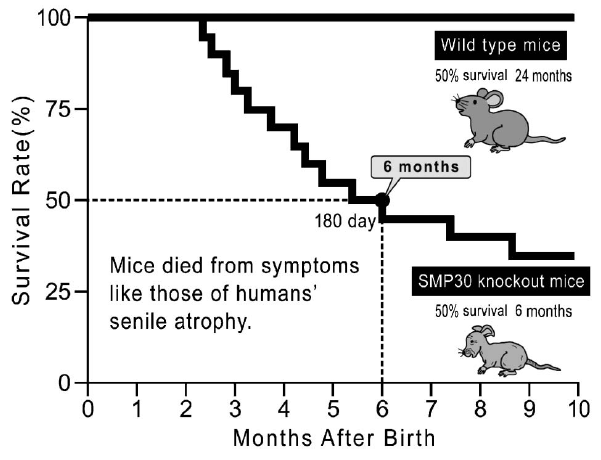 When laboratory mice are bred to completely lack the SMP30 protein (called SMP30 knockout mice) they experience an increased mortality rate beginning at three months of age. Typically laboratory mice live two years, with some living a bit longer. SMP30-absent mice exhibit 3 times greater triglycerides and cholesterol in their liver tissue. Of intriguing interest is that calorie restriction prevents the age-related decrease in SMP30 protein expression (protein making). It appears that production of oxidative stress induced by calorie restriction in these animals increases the synthesis of SMP30. Calorie restriction has been demonstrated to double the lifespan of most living organisms. Would humans ever experience diabetes if they naturally synthesized vitamin C as most animals do? Researchers in Japan compared normal mice with mice lacking SMP30 protein altogether. When mice lacking the SMD30 protein were fed a standard-calorie diet and then given glucose, a simple sugar, their blood sugar levels rose by 25% and insulin levels were decreased by 37%. Vitamin C is required for collagen formation. SMP30 knockout mice cannot internally produce vitamin C as normal mice do, due to the lack of the gulonolactone oxidase enzyme. A complete lack of vitamin C will induce emphysema among SMP30 knockout mice. This is believed to be due to a decrease in collagen synthesis, measured to be 82% less than normal mice. In laboratory mice that do not synthesize vitamin C, brain tissues experience 2-3 times greater production of an oxidizing free radical called superoxide. The provision of supplemental vitamin C to these same non-SMP30-producing animals raises blood levels of vitamin C to nearly the same concentration measured in animals that do produce vitamin C. This suggests supplemental vitamin C may protect brain tissues sufficiently from free radical damage. It is interesting to learn that smoking depletes vitamin C and SMP30 knockout laboratory rats experience greater oxidative stress in their lungs when exposed to tobacco smoke. In compensation for the lack of vitamin C, glutathione, an internally-produced antioxidant, is increased in these tobacco-smoke exposed animals. You walk away from this research asking how long humans would live if that gene mutation hadn’t occurred that resulted in vitamin C no longer being produced internally in humans. You wonder if there may have been something to the claim that humans long ago lived longer, i.e. the Biblical patriarchs, before the mutation that caused SMP30 to no longer be produced and vitamin C synthesis to be halted. – Copyright 2012 Bill Sardi, Knowledge of Health, Inc. Not for posting on other websites.